Decorating and baking with Lorispeak for the holidays! One of my favorite things to pick up at estate sales this summer was Christmas decor. I already mentioned the Shiny Brites I have on my Christmas tree. Why are Shiny Brites so neat? "In 1937, Max Eckardt established "Shiny-Brite" ornaments, working with the Corning Glass Company to mass produce glass Christmas ornaments. Eckardt had been importing hand-blown glass balls from Germany since around 1907, but had the foresight to anticipate a disruption in his supply from the upcoming war. Corning adapted their process for making light bulbs to making clear glass ornaments, which were then shipped to Eckardt's factories to be decorated by hand. 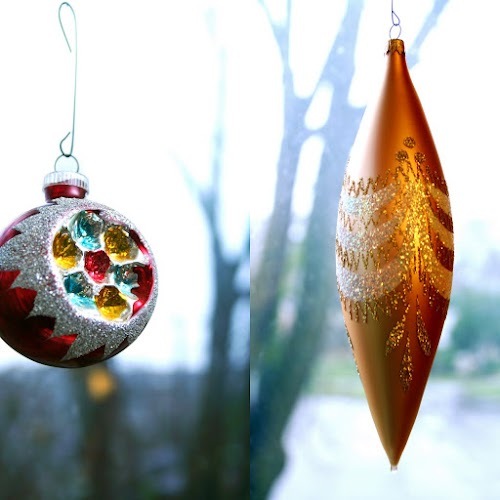 The fact that Shiny-Brite ornaments were an American-made product was stressed as a selling point during World War II." Each box generally runs about $2 at an estate sale around here. You can also find boxes on ebay and etsy. And, I dunno, but I really like the idea of reusing something that has already had a history of celebration with another family. I also picked up this little set of musical angels at a nearby estate sale. These little darlings are currently whippin' up a tune on my mantel. 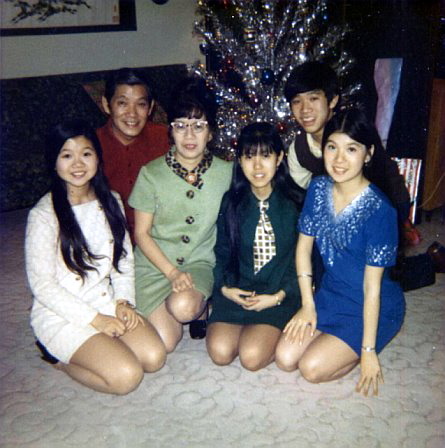 Continuing with the theme of decorating with things of the past, I also pulled out all the old family photos that I could find from past Christmases. I want to sprinkle them throughout the house. 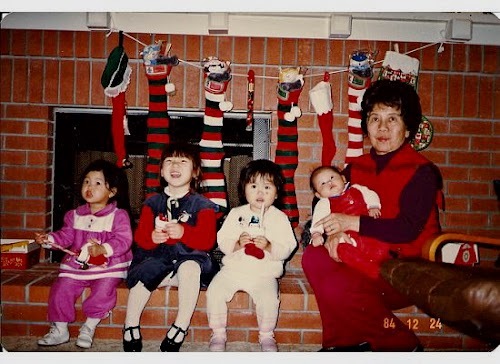 Here's me and my cousins when I was 3 years old. Can you spot me? I'm almost sportin' my favorite pose/expression. I didn't get enough of Thanksgiving food apparently (even though my waistline tells me that I did indeed get enough Thanksgiving food!). So when I came back last week, I decided to make a pie and some cranberry sauce to top it. It was so delicious that I thought I'd post the recipes here. I'm not sure how many of you follow Joy the Baker, but her food photos and baking encourage me to be a better baker and inspire me to eat more baked goods (like I really needed more inspiration to eat such tastiness). Well, way back in August, she posted a recipe for Buttermilk Pie. What the heck is Buttermilk Pie? I had no idea. So of course I wanted to find out. And, I finally did. Oh man. It. was. goodness. You can find the original recipe here. Due to my own time constraints, I used a organic store-bought frozen pie crust. I also added cinnamon, because that's the kind of crazy baking chick I am. ha! And, because I had a huge Costco-sized bag of cranberries in the fridge, and I didn't get enough Thanksgiving, I made a cranberry sauce to top it. The pairing was lovely. 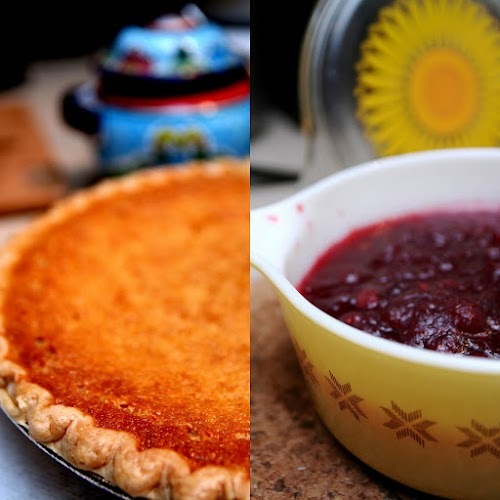 The cranberry sauce was sweet and tart and balanced the buttermilk pie wonderfully (IMO). 1 stick melted butter, slightly cooled. Beat eggs slightly. Mix sugar and flour well and add to the eggs. Mix until creamy. Add melted butter, mixing well. Add buttermilk and vanilla extract and cinnamon. I convection baked mine at 325 degrees F for 1 hr 15 minutes until the custard set. (Joy's Tip: the custard will still jiggle a bit in the oven even when it’s set). Just make sure that the middle does not jiggle a lot more than the sides. That means it needs more time. 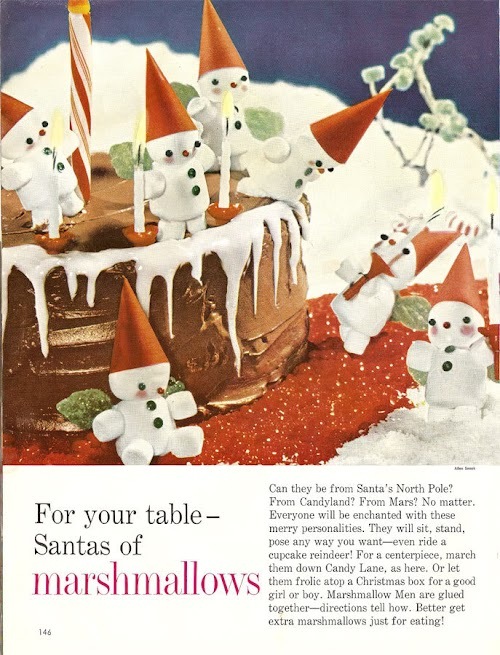 Those santa mashmallows look so fun - it's a clever way to use marshmallows. Omg...that buttermilk pie looks so mouthwatering. oh dear...i think i'm going to have to try it if it's THAT good! thank you!! I just love your granny's glasses.. very cool. haha all your pictures are just so cute and warm and colorful! Oh, I'm off to find myself some Shiny Brites now! Thanks so much for this wonderful post, and that pie looks delish! How do you find out about estate sales? Are they in the paper or something? I'd love to go to one that's like in Bellevue's Hunt's Point neighborhood. Haha! 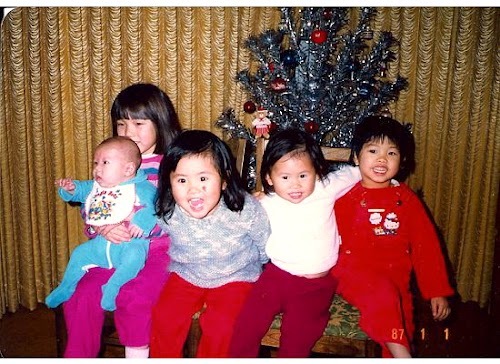 Thanks for sharing your childhood photos. They're so cute. You're so lucky you still have those. I don't have many at all since we didn't own cameras in China. Love it! 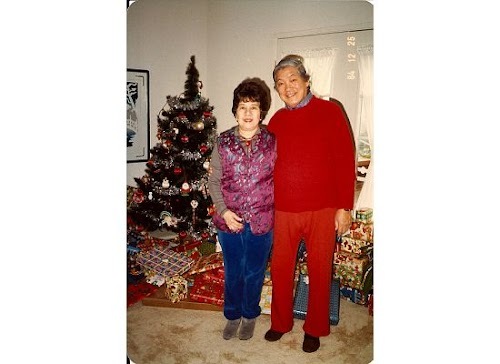 @Cindi People post estate sales here: http://www.estatesales.net/estate-sales/WA/Seattle+++Tacoma+++Bellevue.aspx They also post them on craigslist, but most of the main people who run estate sales tend to post to that first link.